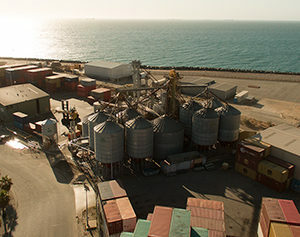 Premium Grains has a container packing facility located in North Fremantle. Our container yard allows us to pack 20ft shipping containers either in bulk or with bagged product. The ability to pack several boxes simultaneously and store them in our yard gives us flexibility and freedom. Premium Grains supplies product on CIF terms delivered directly to the local container terminal of its international customers, employing and managing container shipping company services from Australia. Our packing facility is fully accredited with Australian Quarantine Inspection Service certification to ensure the highest standard. View our product packaging details. Premium Grain Handlers Pty. Ltd.